Dimensions 0 by 6 by 8.25 in. Amazon.com description: Product Description: Enjoy a children's book classic in this perfect to read board book format! Nothing frightens Madelineânot tigers, not even mice. With its endearing, courageous heroine, cheerful humor, and wonderful, whimsical drawings of Paris, the Madeline stories are true classics that continue to charm readers even after 75 years! It's the night before Christmas and everyone is sick in bed. All except brave Madeline, who is up and about and feeling just fine. Taking care of eleven little girls and Miss Clavel is hard work, butÂ when Madeline finds help from a magical merchant, the girls embark on a Christmas journey that will surely make them forget their sniffles and sneezes. Ludwig Bemelmans (1898-1962) was the author of the beloved Madeline books, includingÂ Madeline, a Caldecott Honor Book, andÂ Madeline's Rescue, winner of the Caldecott Medal. Board book edition from Viking Childrens Books (October 18, 2016); titled "Madeline's Christmas"
About: Enjoy a children's book classic in this perfect to read board book format! Har/toy edition from Viking Childrens Books (September 1, 2002); titled "Madeline's Christmas"
About: A packaged gift set provides the book, Madeline's Christmas, as well as a Madeline doll dressed in her finest Christmas outfit. Pap/com edition from Puffin (September 13, 2007); titled "Madeline's Christmas"
About: With everyone else sick in bed with a cold on Christmas Eve, it is up to Madeline to run the school, and she finds a remarkable helper in a rug-selling magician. 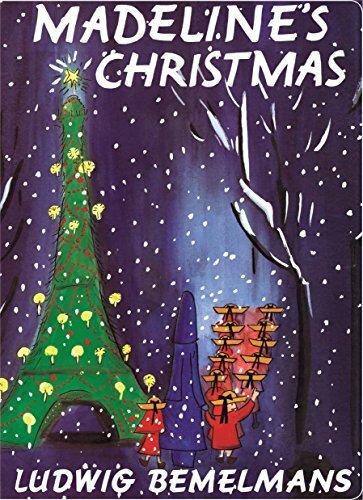 from Puffin (September 1, 2000); titled "Madeline's Christmas"
About: Indefatigable Madeline must help run her Paris school at Christmastime because everyone is ill, but discovers a magician who helps provide a holiday treat. from Viking Childrens Books (November 1, 1988); titled "Madeline's Christmas"
from Puffin (October 1, 1993); titled "Madeline's Christmas"
About: On the night before Christmas all the girls are sick--all except the indomitable Madeline, who must run the school. from Viking Childrens Books (October 1, 1985); titled "Madeline's Christmas"
from Demco Media (November 1, 1988); titled "Madeline's Christmas"
Reprint edition from Paw Prints (April 9, 2009); titled "Madeline's Christmas"
About: Everyone gets her Christmas wish when Madelineâs in charge! from Turtleback Books (December 1, 2001); titled "Madeline's Christmas"
from Turtleback Books (October 1, 1999); titled "Madeline's Christmas"